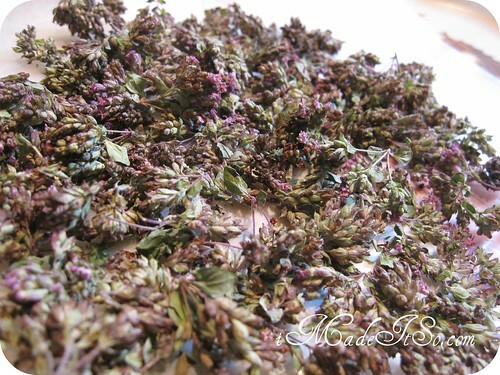 drying oregano blossoms | i made it so. first, there was this list of what to do when you’ve got too many herbs. then, there was this recipe to use up some of those herbs. now, i’ve let all my oregano go to bloom. and by “let” i really mean “forgot” about my oregano (and the rest of my garden) for the last couple of weeks. we’ve been out and about enjoying these last days of summer. the temperature dipped yesterday. sweater weather, which i normally welcome. but then i saw a flock of canada geese heading south, and a yellow leaf fall to the ground. all within minutes of each other. no baby steps, mother nature? nope. i don’t care what the calendar says: autumn is here. i’m still getting some veggies from my little patch garden. tomatoes mostly, with the odd cucumber and green pepper (so tasty fresh off the plant). but my herb garden is booming as always and i have a hard time keeping up even though i use herbs in my cooking constantly. so it’s drying time here. 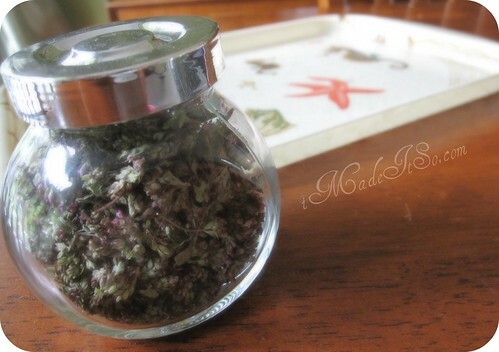 i did a small batch of oregano yesterday. a few days ago, i took a bunch of blossoms, removed most of the leaves (remember when i said the leaves get tough and don’t taste as good when the plant goes to bloom?). i tied them in a bunch with some raffia and hung them in the kitchen to dry. they were sufficiently dried yesterday. i placed them on a piece of parchment paper (to help transfer the blossoms into a jar later), and plucked off the flowers while trying to avoid collecting the tough stems. i will be sharing this post with jami & her readers at an oregon cottage. This entry was posted in green thumb, in the kitchen and tagged autumn, drying herbs, drying oregano, oregano, oregano blossoms, seasons, storing herbs. Bookmark the permalink. I can almost smell your pretty blossom jar all the way from Virginia Ana. smell-o-vision! i’m sorely disappointed each time i remember it’s 2010…and still no smell-o-vision! I can almost smell the oregano here! Ours is growing, but nothing like that! Thanks for sharing! Thanks for visiting my garden. I too must find something to do SOON with our herbs. They are getting out of control. thanks marsha, it really is. Very pretty! Great idea. Thanks for joining FMIC today! Have a great day! if there are any canadian bloggers or businesses out there, make sure you follow fmic’s link (fmic = follow me i’m canadian). it’s a no-pressure, friendly, follow-who-you-want (very canadian eh? :)) link exchange where you can list your own sites/businesses and click through to other sites if you wish. i’ve met some wonderful bloggers and people through them. Beautiful and I’m sure they will be so fragrant when you open them this winter! Beautiful and I imagine eXquisitely fragrant! I didn’t realize oregano leaf flavor and teXture was compromised once the plant flowers. Is that true for basil as well? If so, I’ve got some trimming to do ~ pronto! Great idea, Ana- I always think once they’ve bloomed they’re done, but it’s nice to know I can use the blossoms of oregano (I tried it on some pizza-my part only, as my kids rolled their eyes…and liked it!). Thanks for sharing at the Garden Party! hi jami, it’s always nice when you drop by here. my kids love to pluck the blossoms off the herbs in the garden, but i have to be so careful because the littlest grazer sometimes takes things that aren’t herbs! yikes… who said gardening was a relaxing activity? glad you liked the pizza! we love doing that too! 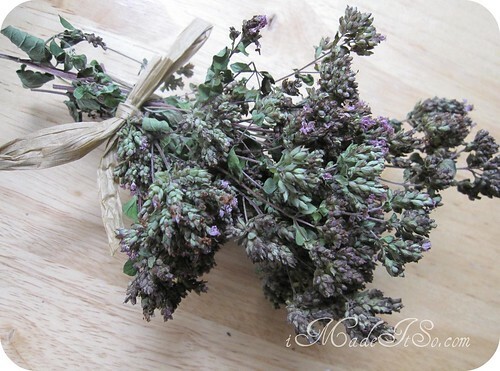 Hi, I have a lot of oregano and some of them have the purple blooms on them and I was wondering what you usually make with them after drying them? hi kimberly, i usually sprinkle them onto anything i’d normally use oregano in… pasta, pizza, salads, dips… hope that helps!